Over the course of 2017, Ireland’s hotels performed really well with a 1.8% increase in occupancy to 78.3%, and a 6.6% increase in the Average Daily Rate (ADR) to €125.95. In Dublin, occupancy growth was marginal, up 0.8%, but nevertheless the city maintains one of the highest actual occupancy levels among key European cities at 83%. 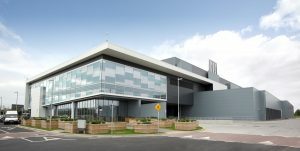 ADR growth has been the main driver of performance in Dublin, up 6.9% to €136.80. While Dublin’s rate growth was a major story for 2017, it is still far from being one of Europe’s most expensive hotel markets. To provide some context, London’s ADR over 2017 was €169.93, Barcelona’s €143.32, and Amsterdam’s was €143.91– to name but a few. Regional Ireland (Ireland excluding Dublin) was the main driver of Ireland’s overall occupancy performance this year, representing a strong pick up in performance, eclipsing Dublin’s moderate occupancy growth. 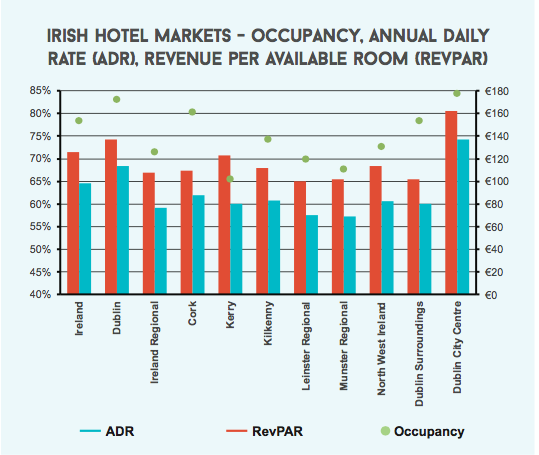 In terms of RevPAR (Revenue per available room) performance North-West Ireland experienced an 8% increase while Munster grew 11.9% for example. is compares to Dublin’s 7.7% growth. 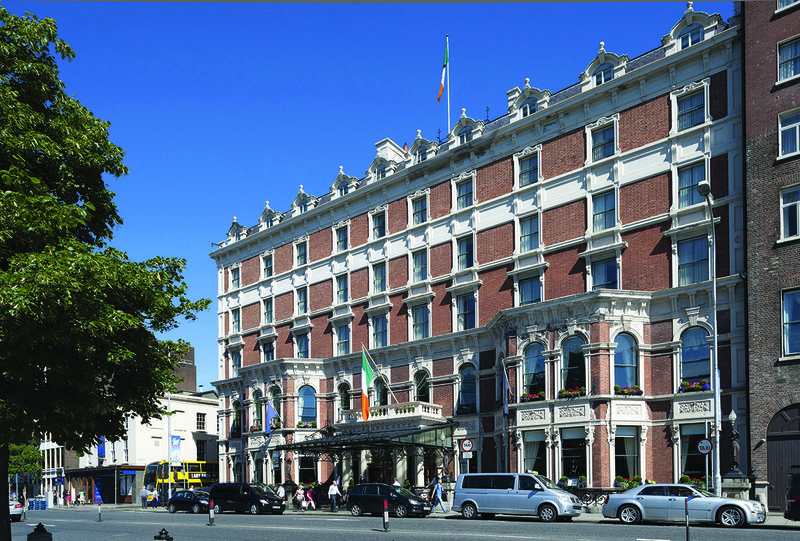 Thee biggest challenge facing the Irish hotel market in the short term is Brexit uncertainty. 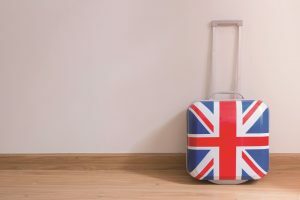 UK tourism demand may weaken further as the British consumer faces higher inflation and economic uncertainties in 2018. Recent data from Mastercard’s SpendingPulse shows that overseas tourist spend for Ireland was up 8.8% YoY in Q4 2017. e leading growth area was US tourists with overall spend up 17.5% YoY, while UK spend was down 1.4% YoY. 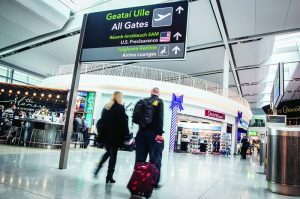 STR and forecast partner Tourism Economics predict that arrivals from the US should grow by 4.5% per year on average through 2021, with increases in arrivals also forecasted from other top source markets for Ireland, including Germany (+3.4% per year through 2021), and France (+3.3% per year through 2021). STR projects an ADR growth between 5.5% and 7.5% in Dublin for 2018. 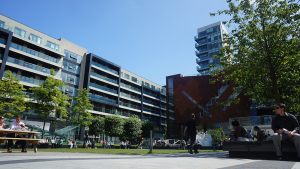 Occupancy is expected to increase by between 0.5% and 1.5%, coming in at an actual level between 82% and 84%. As a result, RevPAR growth should be somewhere between 3.0% and 5.2%, ensuring another strong performance for 2018. Sarah currently works as Director of Client Relationships with STR. She's worked with STR for almost a decade. Prior to STR, she cut her teeth in Business Development at Deloitte.